Ah. Amaryllis - a favorite plant to give, get and grow around the holiday season! A member of the Lily family, its enormous colorful flowers give us a sense of the tropics during these cold winter days. 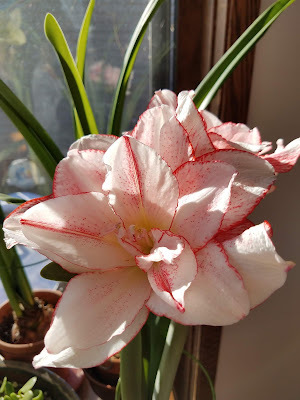 Amaryllis are fun for anyone to grow - I've given them to everyone from 4 to 90 year-olds, bosses and colleagues, family and neighbors. They are inexpensive, beautiful and dramatic additions to any home. But how do you take care of them after they bloom? And why can it be hard to get them to bloom again? Every year people ask us these questions, and while we can't ask the plants, we do have an excellent webpage for all the amaryllis owners out there: Growing and caring for amaryllis. If you are giving amaryllis this year, I suggest printing a copy to present along with the plant or emailing them the link to the recipient for future reference. They'll have everything they need to keep their amaryllis healthy from year to year. Enjoy the holiday season - it's a great time for indoor gardening!